First responders attend to a traffic crash in the rain at 9th and Mississippi in Ada this morning. The July of Rain continued today with bands of rain rolling in during the morning, which is forecast to continue. I don’t normally blog about the weather, but this is quite unusual for any July in Oklahoma. So far this morning (as of 11 am), I have needed to blow dry myself and a camera twice, once after being soaked while photographing the rain itself, then after photographing a traffic crash. The day is young, so I am leaving the blow dryer plugged in. I haven’t blow dried this much since junior high. As an aside, rain will not, as a rule, hurt your camera. If it gets really wet, towel it off, then blow it dry. Some photographers will tell you to use low heat, but they’re just covering the butts. If high heat melted plastic, it would melt the blow dryer itself. 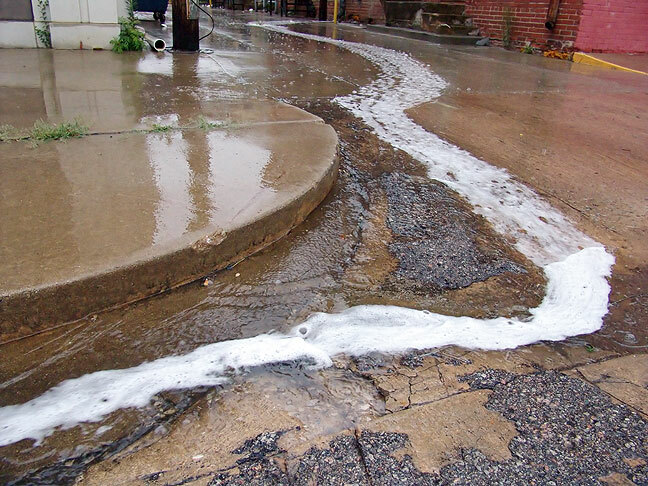 Rainwater runoff makes rivulets on a downtown street this morning. I’m glad it’s headed this way, I need to brush up on my rain photography. I still want to perfect the “Solaris”-type shot of rain on a windowpane. You know what I’m talking bout. Nice notes in your last paragraph. Oh — Soderbergh. I haven’t seen the Lem. I am referring to the opening shot of rain on a window pane.